I feel like I finally have a relationship with my mother and now I’m losing her. Already. For most of my life, I’ve struggled to find a relationship with her that is satisfying. In my teens and 20’s, I could only see that she and I were so different. I didn’t want to be anything like her. In my 30’s I craved her approval. She hurt me often. I was continually disappointed and angry. In my 40’s, I finally saw her: a woman, a mother, a daughter. None of those roles had been easy for her. She didn’t do a perfect job, but she did the best she could. I have forgiven her. I have forgiven myself. We have become something close to comfortable with each other. She calls me for advice on dealing with her difficult mother. And now, just when I have a relationship with her–not the one I’ve always desired, but enough that it feels satisfying–I am losing her. She is losing herself. And so I am filling in for her, making doctor’s appointments, driving her to them, ensuring that she is eating well and taking her medications, helping her record receipts in her checkbook, listening to the same stories over and over. I am becoming her mother. This is not the role I want. I am doing it, though, and I am putting in my best effort to be a good mom to her. I ask her questions to get her talking if she wants, but I don’t push her if she wants to be quiet. I see the fear in her eyes, fear that she might become like her older sister living in the nursing home without her memories. I put on my calm demeanor. I’m losing her. I can feel it. But I also know that God has uniquely prepared me for this. For the past five years I have been helping a friend, now quadriplegic, from MS. I wash and repair her clothing, I record appointments on her online calendar, I read devotions to her. In this way, I’ve learned to be calm, to listen, to be her hands and feet. I’ve worked my way on the path to forgiveness, letting go of past hurts, learning to embrace others as they are, and creating a support system of women who provide the mothering I need, bits from one person, pieces from another. I’ve learned to be grateful for the gifts received from my mother and all the special women God has put in my life. I’ve watched the movie Still Alice multiple times, having been so impacted that I wanted to understand how the black sheep daughter could come home to become caregiver for her mom. I’ve learned a new definition of love that incorporates steadfastness and selflessness without losing self. Yes, I am losing her. But I’m gaining her, too. It’s not the way I always wanted it. I don’t feel prepared for it at this point in my life. But I’m learning. I will be calm. I will be grateful. I will love. How beautifully said, Chris! You hit so many points and feelings…I’ve been a caregiver for my mom for four years! Blessed to have this time with her, though she’s also being lost to us! Prayers for you and yours! Thank you for your comment, Caryn. Four years! What a difficult and beautiful blessing that must be. It is such a strange land to be living in, where roles are reversed and everything else seems turned upside down too. I will pray for you and your mom. This so describes my Mother & me. She passed away 3 months ago & I miss her with all my heart. Paula, I am so sorry to hear of your loss. Writing that phrase–your loss–doesn’t capture what I can only imagine you are going through. Know that you are not alone, that the road is rough, and that you were–and still are–loved. You have my prayers. Thank you, dear friend, for all you are to us in our House of Chaos. Oh how I can see my life through your words. I too, did not have a good relationship with my Mom. It was a rough last five years of her life. I became her helper her aid her driver during her last year. She lost her will after my Dad passed. Three months of trying to forgive then forgave. Three months of loving while not being loved. The last three days of memories while not being remembered. She died three months after my Dad. I still feel cheated out of a mother daughter relationship. She drank herself to death. But I did my best and still do my best to love her. Thank you for sharing your story. Thank you for sharing your own story. My heart goes out to you because I know the pain of rejection. I hugely admire your choice to love while not being loved. Do you have a supportive group of women surrounding you? It was very difficult for me to accept other women in my life to support me during the tough times. I wavered between “I don’t need them” and “I don’t deserve them.” But after many years, I now see how these other women have mothered me in little ways that, while never making up for a mother, still provide what I need when I need it. I hope you have that support in your life. And I know you have the love of a heavenly Father who hurts for you too. I pray that you’ll be surrounded with love, comfort, and the support you so truly deserve. The Motherless Daughters Ministry is a good source of those things, and you can email me any time as well. Love to you, sweet Susie. What a BEAUTIFUL picture of Christ. Thank you for sharing your heart. I am so sorry that you are losing her all over again, but know that God is bringing beauty from ashes. Thank you for kind words and loving support. What a gift to have wonderful friends who understand us. Thank you for that! 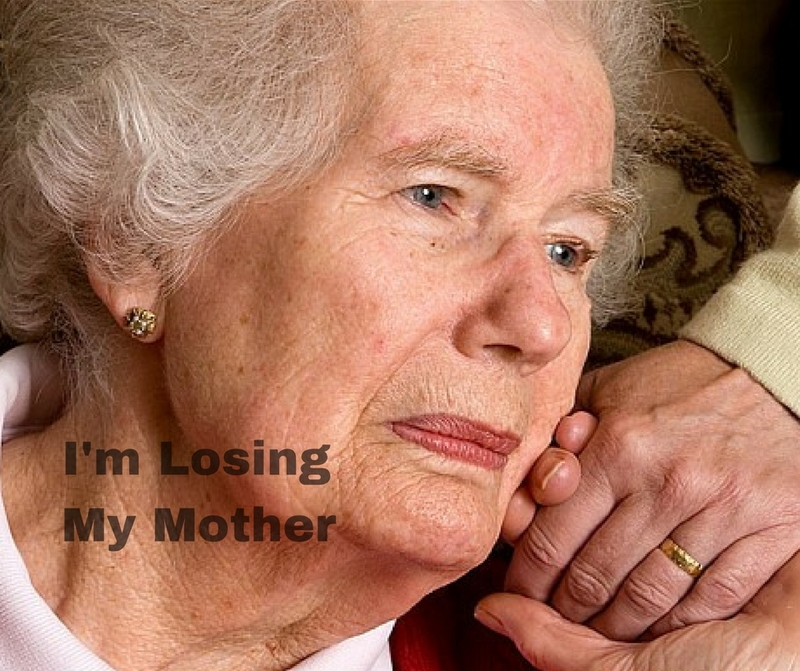 My mother and I were close, for my father abandon us when I was very young. My mother did the best she could to keep food on the table and a roof over our heads. We never lost that bond but never knew it could possibly get stronger until she had a stroke in 2000. I had a career but decided to step out in faith to care for her in our home. I lived with her in the nursing home for 5 months, never leaving her. She was leftsided paralysis and in a wheelchair. I conformed my home into a physical therapy hospital setting to make it easier for her to transition to this new life. I took care of her for 12 years, 24/7 and it was a blessings to do so. compassion, strength, wisdom and courage. I knew God was surrounding us with His presence each day, even though sometimes my heart ache for us. Thank you so very much for sharing the beautiful story of your relationship with your mom. Wow, I am overwhelmed with awe as I read your story. Your mother was clearly an amazing woman, and she raised one too. You have a beautiful and loving spirit that shines through your letter. I think it must be the Holy Spirit. I will reread your letter on tough days, because it will help remind me what can come from persevering in love.